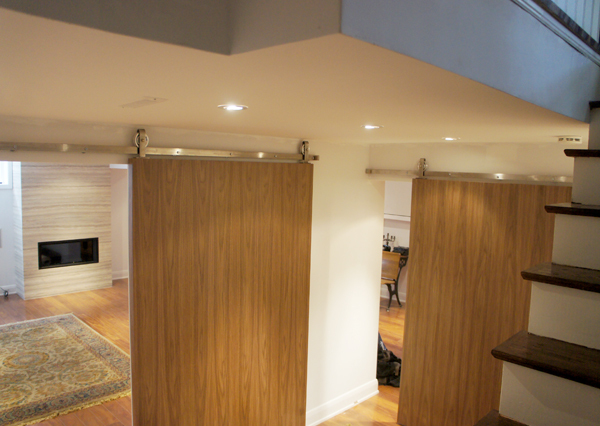 We make and sell premium barn door hardware. 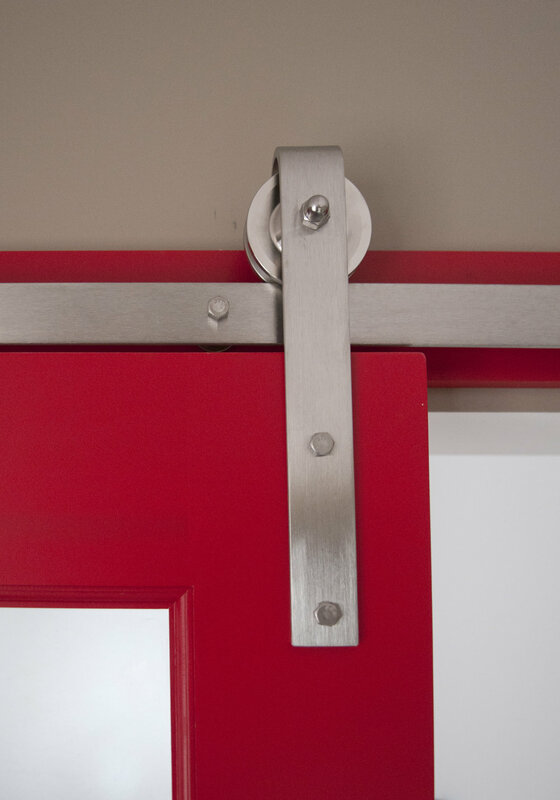 Our hardware is made in Toronto so you can be assured of their origin, durability, and quality. We ship our hardware kits across Canada and the U.S. There are several different styles to suit every budget and living space. Here are samples of our hardware kits to help you see what is included in each kit. Please note, however, that the exact contents depends on the hardware style you are purchasing! The Heavy Metal is made from raw hot-rolled metal, with high quality nylon wheels. The track can be customized to exact length. *Please note this hardware is not black. It is made of unfinished, raw, hot-rolled steel. Price: $195 for track length up to 6' + $16 per additional foot. The Stainless Steel, as the name suggests, is made of hand-polished stainless steel. The wheels are made of solid aluminum. The track can be customized to exact length. Price: $585 for track length up to 6' + $30 per additional foot. The Spoky Stainless is made of hand-polished stainless steel. 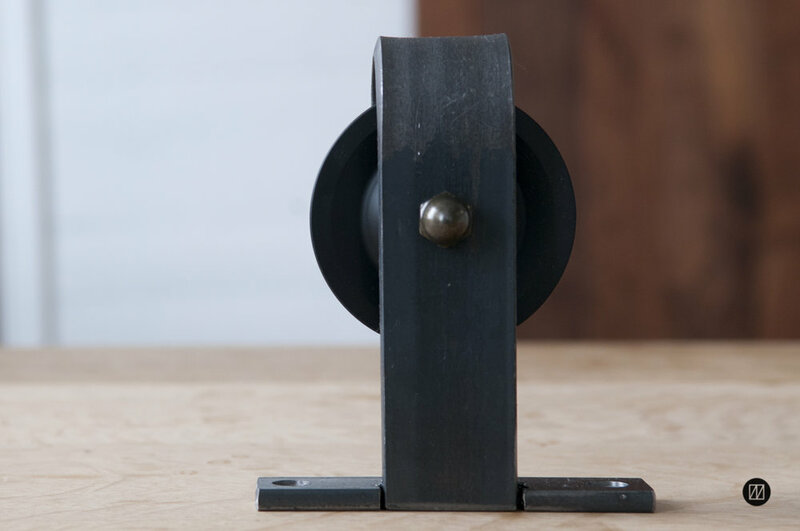 The wheels are 4.5” diameter and made of solid aluminum. The track can be customized to exact length. Price: $630 for track length up to 6' + $30 per additional foot. The Horseshoe is made of raw hot-rolled metal, with nylon wheels. The track can be customized to exact length. *Please note this hardware is not black. It is made of unfinished, raw, hot-rolled steel. Price: $345 for track length up to 6' + $16 per additional foot. The Arrowhead is made of raw hot-rolled metal with nylon wheels. The track can be customized to exact length. *Please note this hardware is not black. It is made of unfinished, raw, hot-rolled steel. Price: $230 for track length up to 6' + $16 for each additional foot. The Brassy Beau is completely solid brass, including the wheels. The track can be customized to exact length. *Please note for strength, lag bolts are brass plated steel. Price: $650 for track length up to 6' + $40 per additional foot. 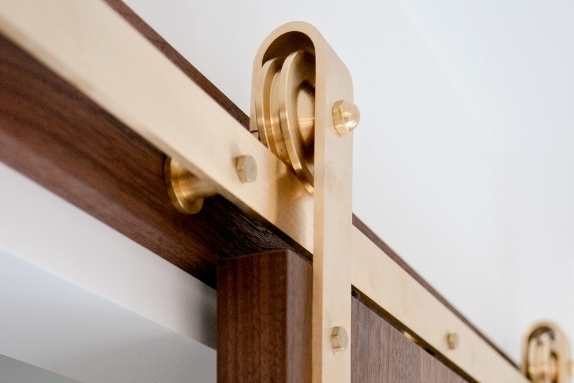 The Top-mount comes in two finishes and can be customized to exact length. Hand polished stainless steel with aluminum wheels. Price: $650 for track length up to 6' + $30 for additional foot. Raw hot-rolled metal with nylon wheels. Price: $270 for track length up to 6' + $16 per additional foot. The T-Slide is made of aluminum, with high quality nylon wheels for smooth and quiet movement. The track can be customized to exact length. Price: $180 for track length up to 6' + $16 for each additional foot. Some openings require two doors. Depending on your situation, these doors can be installed in one of two ways: (1) bi-parting or (2) single track bypassing. All our hardware kits can be installed this way. In a bi-parting system, two doors are installed along the same track; the doors slide away from each other to open and slide towards each other in the middle to close. 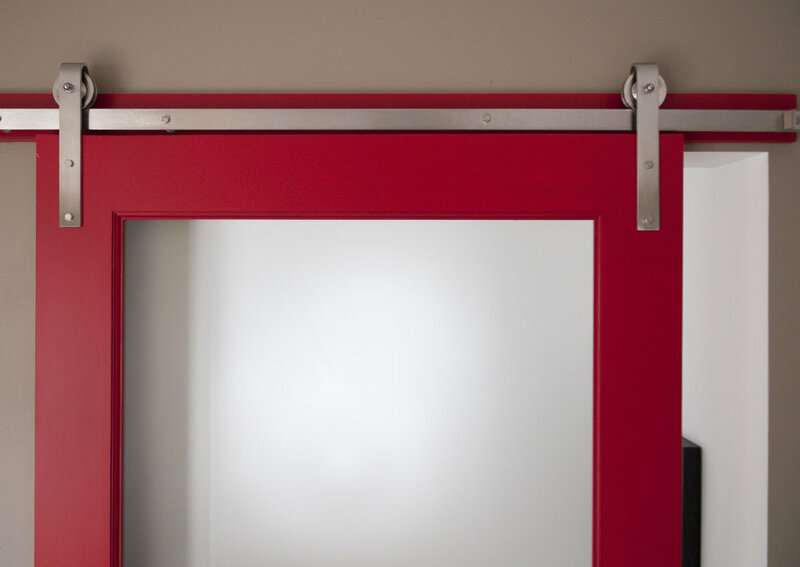 Our patent pending single track bypassing system supports two doors sliding on a single track, with one door sliding behind the other. 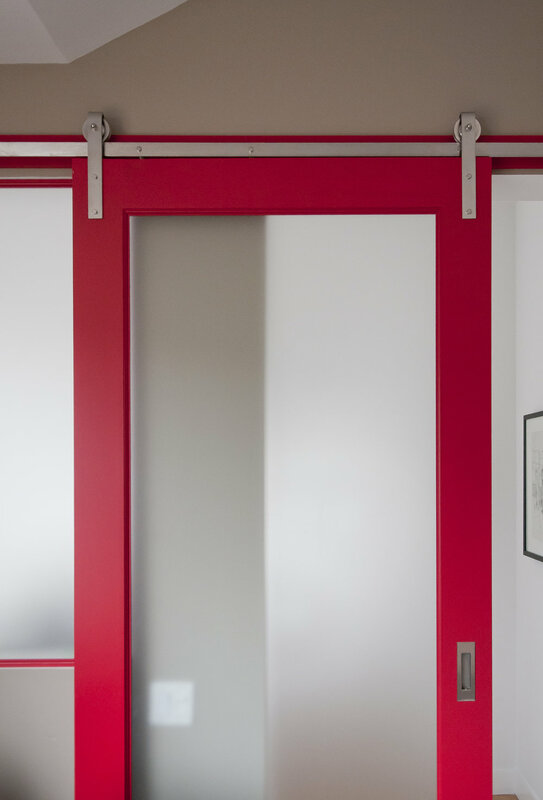 This system is ideal for when you have a large opening but not the wall space for a large door, nor the wall space on both sides of the opening to have two doors in a bi-parting configuration. Check out this video to see how the bypassing system works. 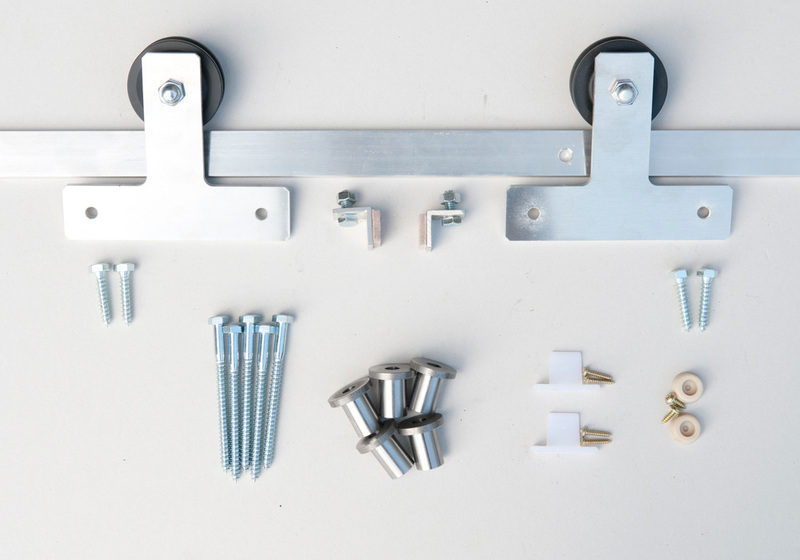 We do not recommend this hardware kit for DIY installation as it is quite tricky and often requires onsite adjustments. Please contact us for installation service. 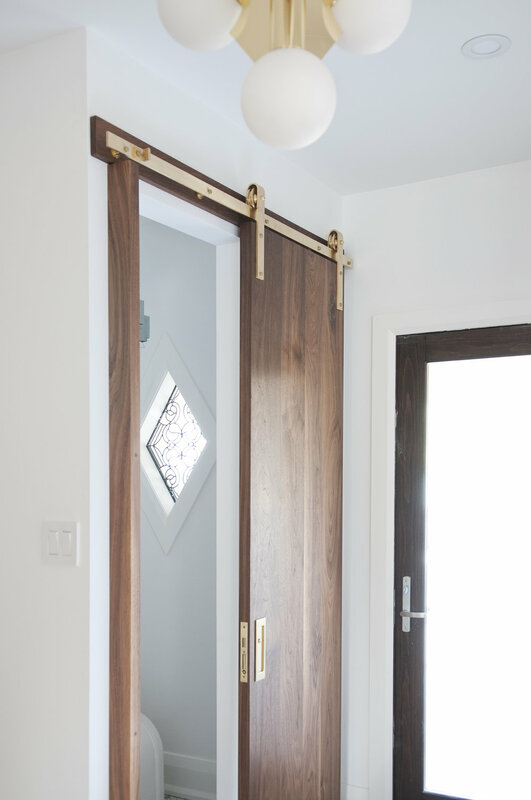 **Maximum door thickness is 1.5"
Download installation manuals (PDF) for our bi-parting, single track bypassing, and T-slide hardware below. If you choose to have a handle for your barn door, here is one that we make. It is approximately 10" long, but can be customized to be longer or shorter. Some of our customers even choose to make it almost as long as the height of the door. Price: starts at $35. We ship our hardware across Canada and the U.S. If you cannot pick up the hardware from our Toronto studio, please provide us with your location when you get in touch with us and we’ll be happy to quote you the shipping and handling cost. How do I order from you? Do you have an online ordering system? What forms of payment do you accept? Due to the highly specific nature of our products, we don't currently have an online ordering system. To place your order for hardware, simply email or call us and let us know what you're interested in. We accept email transfers, paypal to info@1925workbench.com, cheques, and credit card. We only ship the hardware across Canada and the U.S. If you need our finished doors to be shipped to you as well, please contact us for more shipping information. Please note this is the maximum recommended weight. 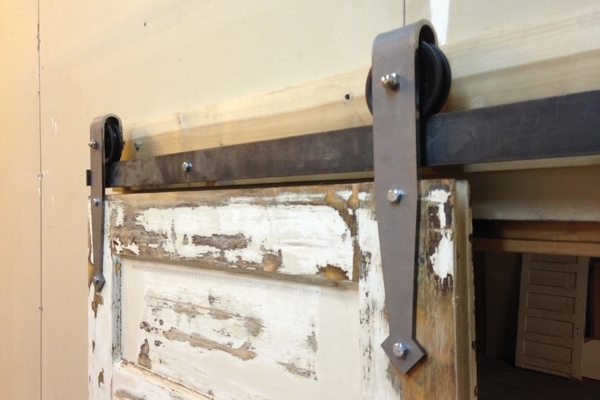 The barn door hardware track should be mounted on every stud along the length of the track. 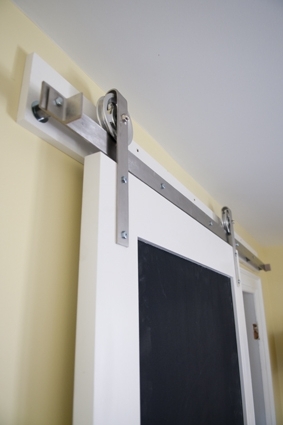 The barn door hardware is made to accommodate doors up to 2 ½” thick. Your door should be around 4" wider and 1" higher than the actual opening. That way, you will have 2" of overlap on each side of the opening for added privacy. The minimum required headroom, i.e., distance between the top of the opening and the ceiling, is 6 inches. However, 8"–10" is recommended for easier installation. 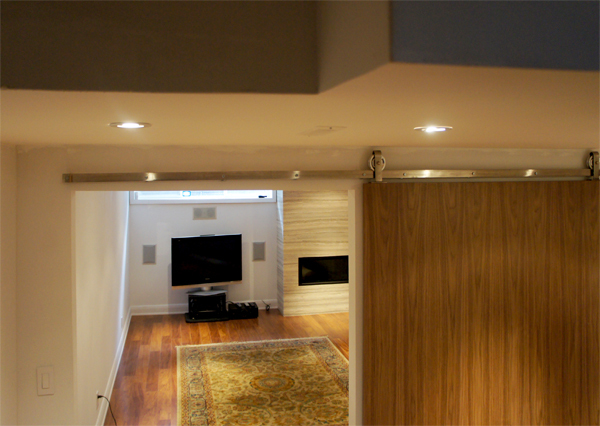 If you do not have at least 6” clearance, we have the box track that only needs 2.5" of headroom. Contact us for details. What is the floor guide and do I need to install it? What should I do if I have existing door trims? 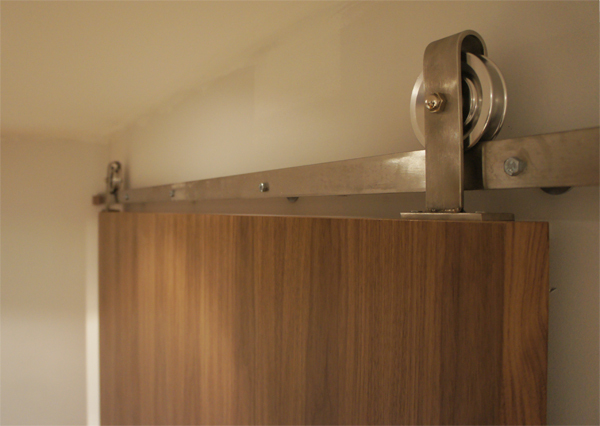 The barn door hardware is made so that there is a 1" gap between the door and the wall. So long as your door trims are less than 1” thick, you won’t have a problem. What should I do if my door trims are over 1" thick? Please let us know when you order so that we can make the spacer longer for your track. 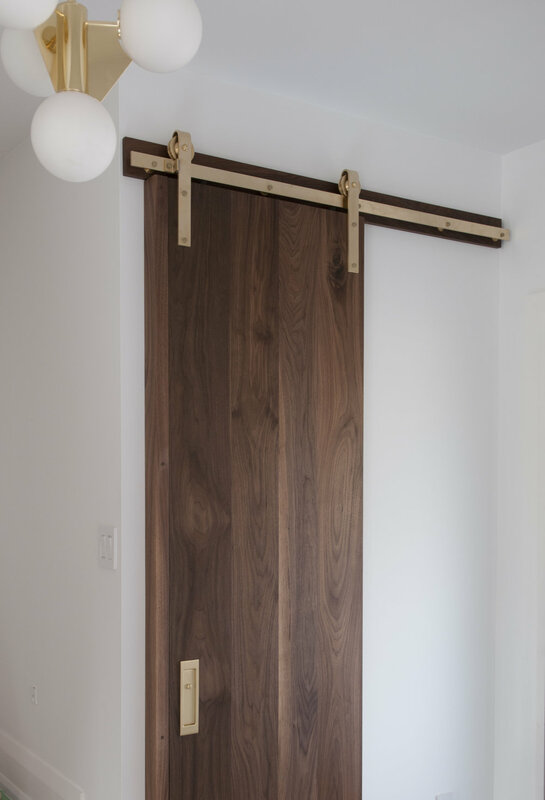 How do I install the barn door hardware? 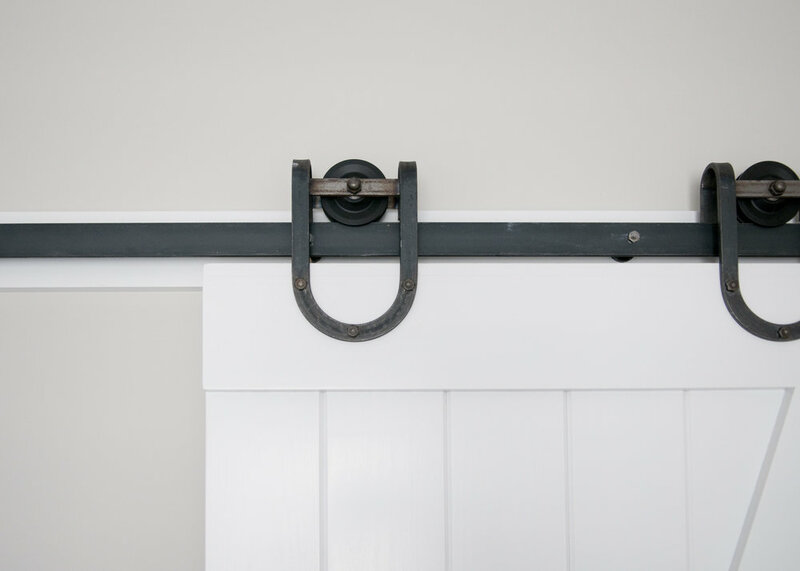 We have installation instructions for every type of barn door hardware if you intend to take on this exciting project on your own! Please see the product descriptions above for downloadable instructions (pdf). Otherwise, we offer delivery and installation services starting at $450. Talk to us for details. 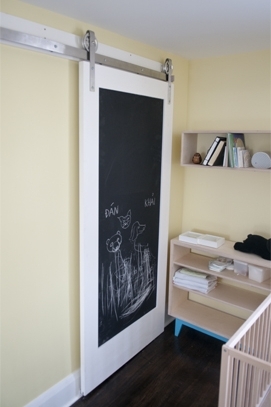 Does the barn door hardware make a lot of noise when you slide the door? We use high quality nylon/polymer rollers with built-in ball bearings that make very little noise when in motion. You will be surprised how quiet it is! 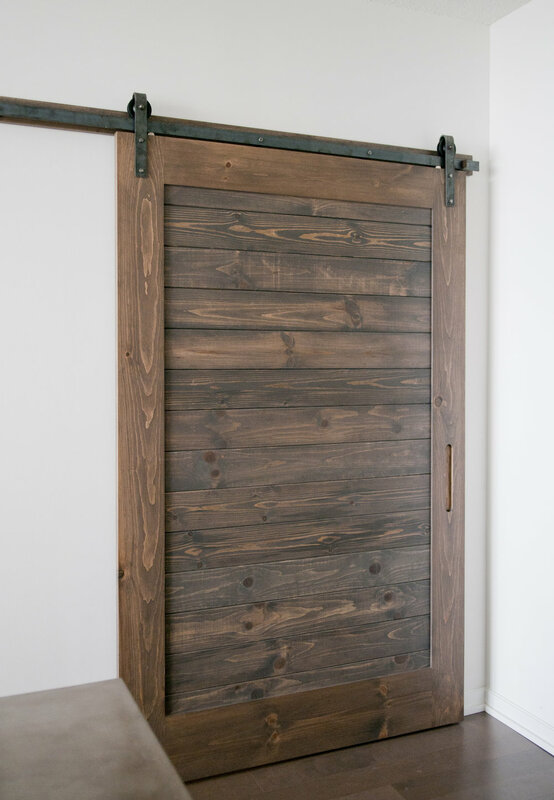 Can I use the barn door hardware outdoors? We ship our hardware across Canada and the U.S.! Unfortunately, we aren’t able to fulfill other international orders. No problem! Please get in touch with your question and we’ll be happy to answer any questions you have for us.